In 1940, the mathematician Edward Kasner published the book "Mathematics and the Imagination", in which he popularized the words googol and googolplex which his nephew suggested as names for big numbers. using the exponential notation, it has often been claimed that the number googolplex is so large that it can never be written out in full. 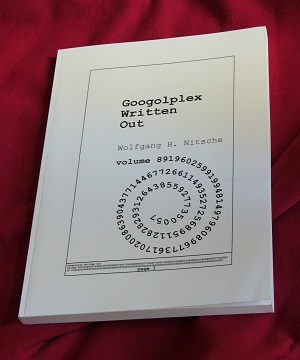 However in this "Googolplex Written Out" multivolume set of books, I am doing just that. It consists of 10 000 000 000 000 000 000 000 000 000 000 000 000 000 000 000 000 000 000 000 000 000 000 000 000 000 000 000 000 000 000 000 volumes, and each volume contains 1 000 000 zeros of the number googolplex. The first volume also contains the initial digit one with which googolplex starts. All volumes are available online as free PDF files. They might also be available in the print edition.